I have got 6700 to play almost 100 % with N1MM with SO2. However, when using Ctrl F1 to switch "F1 CQ.." transmission to other slice N1MM follows correctly the command but 6700 stays on its present RX focus slice as no command was sent. This happens almost always after a warning has popped up on Smart SDR "Transmit slice not selected". Next TX session it shifts to correct slice. Anyone noticed this? I have configured 10 ms delay of "Focus helpe" on Radio setup. This occurs when I interrupt the outgoing CW message on one slice to send a CW message on the other slice. N1MM+ and a Flex 6600, SSDR 2.2.8. Hi Tim, yes it dissipeared with the internal winkeyer. Never went back to the external keyer. But I will try to test later today for you. I can also repro this with my 6600M and need to debug and fix this. Do you use external WinKeyer or Flex's Winkeyer? See my 52 second long YouTube video at the above link for an illustration of what I mean when I say "duplicate sidetone." Using the external Winkey eliminated the duplicate sidetone but has introduced the problem of the slice not switching properly. N1MM behaves as I would expect in either case. In summary: with the external Winkey the Flex will sometimes not switch to the other slice and TX there when commanded to by N1MM. With the internal Winkey the Flex will switch and TX on the other slice but there is an echo or duplicate sidetone. In either case, the problem occurs when I use N1MM to interrupt a message being sent on the first slice to TX a message on the second slice. I'm trying to decide now which problem I would prefer to live with during this weekend's NAQP CW. N1MM+ team is looking at this, but I am not sure how fast this can be fixed. In terms of this weekends contest, if it is not fixed by then, is it an option to use the Flex WinKeyer emulation with side tone off? Hi Tim, I have just concluded tests with the external Winkeyer. I am sorry to say but the problem with "Transmit slice not selected" remains. I wonder what effects this. Are there some settings that are not correct. I remember that this fault was less of a problem with Writelog. I will test tomorrow. Thanks, Andy, I plan to use the internal Winkey emulation this weekend. One other CW thing I have noticed (this is with SSDR 2.2.8 and N1MM+ 1.0.7230, although this goes back several weeks so is not new in N1MM+ 1.0.7230) is that I can't change CW wpm speed while a message is being sent. Hitting the Page Up and Page Down keys changes the wpm speed in the N1MM+ Entry Window, but the actual output speed of the keyer does not change. Once the outgoing message finishes, subsequent messages are sent at the new speed. This includes CQs when CQ repeat is enabled: if I want to start calling CQ faster or slower I can change the speed mid-message with the Page Up and Page Down keys and this change is reflected in the Entry Window but the actual output speed will not change until the current CQ finshes and the next CQ starts. I have been playing with this some more tonight. It really seems to be some timing issue. Can anyone of you do a simple test for me please? - Set Delay to 0 in radio transmit settings. Can you still reproduce this issue, or does the switching between the slices work with these settings? Hi Andy! It works now with no swiching anomalities like reported before!! Great work! I had previously SO2R switch time to 10 ms. And 0 for leadtime and 0 for tail time. 73s and lots of thanks for the assistance. I owe you now some "Mjöd" (= type of bear made of honey by the Vikings). Andy: I'm not familiar with the "radio transmit settings." Is that an N1MM setting or an SSDR setting? SSDR. Full break in QSK. I will try these settings in the 1900z CWT. Andy: I tested your suggested settings two ways. First test was running N1MM+ with SSDR 2.2.8. Everything appeared to be fine. The radio always followed N1MM+ when I interrupted a message on the first slice or radio to send a message on the second slice or radio. Never saw the pop up warning about transmit slice not being selected or TX slice may not be changed while transmitting. I played with different delay settings (from 0 to 200) as I don't care for QSK in an SO2R setting and the delay setting did not seem to make a difference. I was not in an operating situation so I was transmitting into dummy loads and figure I probably ran through 50 or so interrupt cycles with no problems. Second test was running N1MM+ with a Maestro in the 1900Z CWT. Once again the radio always followed N1MM+ when I interrupted a message on the first slice or radio to send a message on the second slice or radio. However in this case I did occasionally (25% of the time?) see the two warning message pop up in a little box in the top center of the Maestro screen early on. It did not seem to affect operation, however, since the radio was following N1MM+, and as I focused my attention on the contest I soon stopped noticing it. Once again I played with the delay setting and it did not seem to make a difference. I made 104 QSOs in the CWT so I would guess I had nearly that many interrupts during the hour. - Set Delay to 0 in radio transmit settings (full break in QSK). I usually do not QSK and was under the impression a small delay was better than a long delay. Since you said it does not make a difference, I will have to go back and verify. Will report back here when I know more. Hi again, I just tested with both SDR 2.2.8 and Maestro. Could not see any difference in performance. It works just as it should. Very efficiently. I was using the external genuin Winkeyer for the CW keying. I plan to write a tutorial for us with screenshots of config menys. The difference Tim reported in Maestro I could not repeat after some 130 switching times between slice A and B.
Kari: could you describe how you have things connected on your LAN? Do you connect to a switch or a router, or maybe both? And if there is a router involved, do you connect the Maestro with WIFI or cable? I use a 4G mobile router to the Dlink 24 port switch. The Maestri is hard wired to the LAN at home or remote QTH. It is more reliable than wifi. Thank you for the video, now SO2R seems to work pretty well! I ́m wondering how the RX audio management works with N1MM+ and a 6700 or 6600. Could you please explain how to control the audio you want to hear at each time? Is it possible to configure the RX audio to your needs? Do you control the audio using Tilde key (Stereo ON-OFF) in N1MM or is there any other way? Your comments will be much welcome! Yes I use two methods to control audio. First tilde (or EU keyboard equivalent) to toggle between stereo or mono. Then I use the N1MM SO2R functions "swap to other" and "focus on other" which makes the entry window to swap to other transmit window (after CQ message ended) where CQ was initiated. Mean while you have the entry window audio in both ears. Really quite near scenario one. Unfortunately you cannot tailor it more. But one big advantage is that you may, while answering or typing on one entry window (say slice B) initiate a CQ on slice A with Ctrl+F1 while not leaving the entry window (slice B). This could be whatever F message actually. I do not know of any logger that makes it this handy. DXLog will allow you to custom design the audio as you want. I have tested a beta release but it did crash a few times during contest so I have out it on hold. Thank you for your answer Kari! I have been using N1MM+ with 2 radios for a while. I use 2 keyboards one for each radio which helps a lot to avoid mistakes when you are getting more tired during a contest. Ctrl+F1 is really very nice, but I suggest that you try with a second keyboard. I was asking all these questions about how to control the audio because actually I use a Microham u2R for audio management, so I just put N1MM in "Stereo Mode" and the rest is managed with the external device. I will take a closer look to the "swap other" and "focus other" options. I was using them before having 2 keyboards but just for cursor focus, not for the audio. I wonder if a 6600M or 6700 will handle a full 48 hours contest dueling CQs with 100W... that ́s one of the doubts that keeps me out of using just one radio instead of the two I ́m actually using. Hi Jon, ok I see. I don not think N1MM supports two keyboards though. I have been using my 6700 now for several big contests (latest WPX w 1650 Q/700 mult) running SO2R for abt 36 hours per contest. No problem whatsover. You may know K9CT he uses 5-7 Flex radios in multi op set up. Another major advantage is the simplified LAN or USB steering of amplifiers, antenna switches e t c.
Two Keyboards - Plug in two keyboards before starting N1MM+. The first keyboard you type in controls the left Entry Window. Other keyboard controls right Entry Window. Pause key is disabled. \ key moves to Entry Window associated with that keyboard. I also have been using a Flex 6300 remotely with a VPN in some contests with good reliability since 3 years ago in SO1R, but when I want to use 2 radios for SO2R operation in a contest I operate on-site just to avoid issues. That ́s why the 6600 or 6700 may be very interesting to me, because as you said they are a major advantage and simplifies the 2 radio layout a lot and operating SO2R remotely will be very easy. I didn ́t made the change for the moment because I knew there were some issues with delays and anoying audio clicks, but now I see it ́s solved! I know from using the Flex 6300 that it can handle a 48 hours test at full power with no issues, but dueling CQs (also called 2BSIQ by CT1BOH http://www.qsl.net/c/ct1boh//2bsiq/) is like using the radio full duty, the radio is almost all the time transmiting. I supose these radios are designed to handle full duty as the PXL amplifier is, but this is now my only fear. Thank you again for the very interesting thread! Thanks Jon for all valuable thoughts. I will check two keyboards eventhough I am sceptic to more hip movement. About duty cycle I have not heard any reports indicating that the flex 6000 series would not handle 100 % CW cycle. Look forward to working you in the up coming contests. I have tried two keyboards and looks very promising. Sorry you can not get the full 2BSIQ ear phone scheme with two earphones between switching TX slots between radios. The back to radio1 or 2 in both ears automatically. "Time slot 4" as Jose calls it.Or have you solved it another way? Thank you again for the feedback. I can ́t tell you how to solve the audio switching issue because I "still" don ́t own a 6600 or 6700. I will really appreciate if you can continue with some more tests. I have been using a 6300 for almost 3 years but I just sold it to buy a new one. The purchase decision of a 6600 will depend on these audio switching capabilities. - Microham receives the info from the 2 radio ́s PTTs from N1MM. When TX1, RX2 in both ears. When TX2, RX1 in both ears. Could you please try to make the following tests? Please configure N1MM in SO2R operation, create 2 different radios with one CAT asigned to each one ot them (Slice A = Radio 1 with CAT1 asigned, Slice B = Radio 2 CAT2 asigned). Then choose Stereo mode with tilde key and select "Swap other" and "Focus other", and very important, select "Run" on both radios as well. At this moment, if no TX, you shall be hearing both radios in Stereo (Slice A on left ear, Slice B on right ear), is that correct? Then, if TX1 you shall hear RX2 on both ears (or are you hearing RX2 just on right ear?) Opposite situation when TX2... This audio switching is happening with the help of "Swap other" or "focus other" I ́m not sure which one of them (Sorry I can ́t test it at this moment on N1MM). I hope one ot these 2 ways to operate 2BSIQ will work! Cross my fingers. Hi Jon, I will test. But I am quite sure that without a device like mikroham that controll audio mix between earphones this cannot be achieved with only Flexradio and N1MN unless you manually switch to stereo between the time radio A just stops CQ (earphones both on radio B) and radio B prepares to send F2 message. During T4 time slot. Mikroham does this completely automatically as I understand with the PTT line. Looking forward hearing from you. 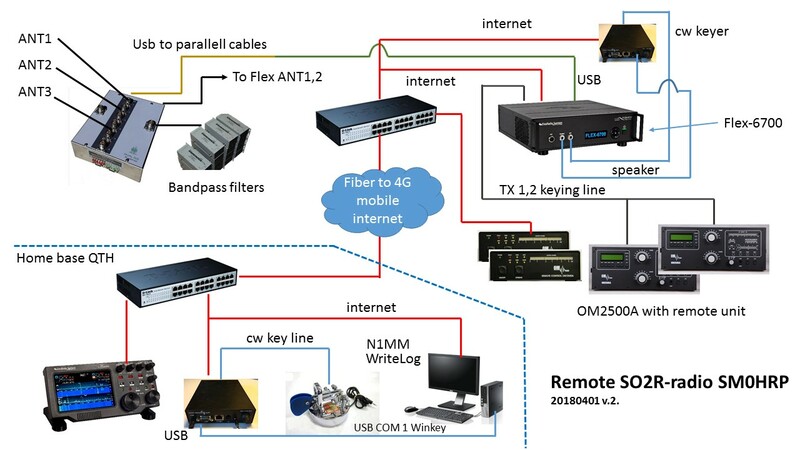 The comunication with N1MM is handled by the MK2R protocol despite the OTRSP protocol Flex radios are using. But anyway, both protocols exchanges the same information as far as I know. The important point here is the last sentence of the photo: The "Stereo" state overrides all other states. This means that if Stereo Mode is selected on N1MM, when no TX, you will have stereo audio on your headphones and when you TX on one radio/slice you will hear the other one in both ears. I think N1MM "focus other" function shall handle the audio switching when TXing as we expect when both radios/slices are in RUN mode, please let me know the result of your testings. I will copy this post on the other one you just opened to follow up our discussion there. Thanks everyone for testing and helping to find some good configurations to have external WinKeyer play nice with N1MM+ and Flex in a SO2R scenario. Just to close the loop and report back, I think we can live with the values as described above. Still, I think there is a Flex software issue at play here. I my case, the Flex QSK delay setting has a huge impact on this working correctly or not. If I set my delay to below 100, all is great, but if I increase it, the switching of TX focus starts failing as described above. I think setting the QSK value to a lower value is doable as a workaround, but I will be submitting a software issue report so it can be looked at. Thanks for the follow up, Andy. I can report that in yesterday's NAQP CW, in over 800 QSOs, I did not have any problems using your recommended settings and an external WinKeyer. I did occasionally see the pop up warning on the Maestro but the slice always switched when I needed to interrupt a message on one slice to send a message on the other slice. It would be nice if we can get to where a longer delay (i.e., not full QSK) can be accommodated but, for now, we are in a good spot. I did notice one other thing while operating yesterday, don't know if it is related or not, but seems to suggest some sort of disconnect between N1MM and the Flex when it comes to how the slice focus is handled in SO2R. There were a number of times that I would be calling CQ on slice B with slice A in S&P mode and decide I wanted to check for activity on another band using slice A. I would click on the appropriate band panel button on the left side of the slice A Entry Window to cause that slice to QSY. Sometimes this would work as expected and all was fine. Sometimes I would get the pop up window that either says "TX slice may not be changed while transmitting" or "Antenna may not be changed while transmitting" but the slice would still QSY. A couple of times the CQ message that was being sent on slice B would be transferred mid-message to slice A. Testing just now, I get similar results if I type a new frequency into the slice A entry window and hit the Enter key instead of clicking on the band panel button. I soon learned that I needed to wait until the message had finished on slice B before doing the QSY on slice A, which always worked fine. So this is not a hot issue for me, I share it just to add some info to the overall puzzle. Andy contacted me directly about the QSK setting so I've entered an issue (#6556) for our team to go have a look at this. The likely scenario is that we made a decision not to allow a switch when the transmitter is on rather than just shutting off the transmitter and switching. I'll post back here as we find out more. Great Steve, very much appreciated. I can do some testing if you want with WriteLog, DXlog and N1MM.